China To US Navy Chief: Army Will Defend Taiwan Claims "At Any Cost"
A rare and under-reported tense exchange occurred between US and Chinese military commanders in Beijing on Tuesday. 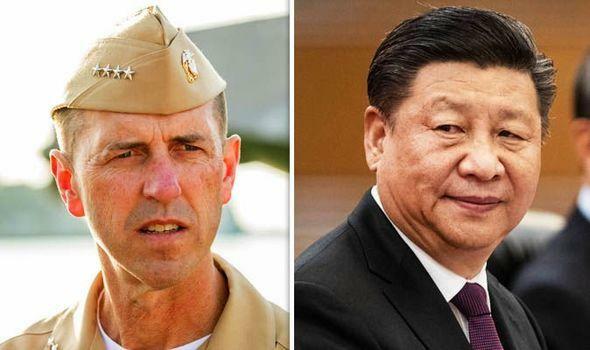 A high level Chinese military official, General Li Zuocheng, told the head of the United States Navy, Admiral John Richardson, in a face to face meeting that Beijing would defend its claim to Taiwan "at any cost". "The Taiwan issue is an internal matter of China, concerns China's fundamental interests and the national feelings of the Chinese people, and no outside interference will be tolerated," Li Zuocheng said in a statement released by the Ministry of Defense, cited by the AFP. Admiral John Richardson traveled to China for talks aimed at reducing "risk and miscalculation". After a series of recent instances involving US Navy warships making provocative passages through the Taiwan Strait — which the US says is its right according to freedom to navigate international waters, it appears China is going "gloves off" in direct statements challenging US military commanders. If anyone wants to separate Taiwan from China, the Chinese army will defend the unity of the motherland at any cost. Alarmingly this comes after President Xi Jinping provoked an angry rebuke from Taiwan's pro-independence president when he demanded during a landmark speech on Jan. 2 that Taiwan submit to "reunification" with Beijing. And in a follow-up speech days after this before military officials, Xi took his belligerent rhetoric one step further by issuing his first military command of 2019: that "all military units must correctly understand major national security and development trends, and strengthen their sense of unexpected hardship, crisis and battle." Xi had essentially ordered the Chinese military to prepare for war as his first act of 2019. Thus it appears top military officials have been emboldened, enough to deliver the uncompromising face-to-face message of an "at any cost" defense of China's longtime claims over Taiwan in this week's meeting with America's highest naval officer. China's foreign ministry has consistently condemned US ships passing through the Taiwan Strait as an issue of "China's sovereignty and territory" — to which the Pentagon has responded in multiple statements expressing commitment to "a free and open Indo-Pacific.” The Pentagon has pledged in repeat statements: “The U.S. Navy will continue to fly, sail and operate anywhere international law allows,” he added. Just the day prior to the Chinese military's severe warning of non-interference, Admiral Johnson hailed the talks as a “constructive and candid” discussion with his Chinese counterpart. Richardson is meeting with senior leaders of the PLA, with the goal of “continuing a results-oriented, risk reduction-focused dialogue” between the two militaries, according to a US navy statement. Or in other words, the two sides are working to prevent prospects of any "unintentional" series of "accidents" and provocations that could lead to a major US-China war that a number of analysts have predicted could result from the current soaring Washington-Beijing tensions on many fronts.